Suggested Use: 1/4 teaspoon mixed in water or juice as desired, preferably with a meal. For reference, one level teaspoon contains approximately 4.26 grams of vitamin C.
Vitamin-C (ascorbic acid) — An excess won’t hurt you, but a deficiency will ruin you. reduced cold and flu symptoms by 85% (1000 mg/hour for the first 6 hours followed by 3000 mg/day). ABOUT THE POWDER FORM: A level quarter teaspoon of Vitamin C powder weighs about 1200 mg.
Major vitamin C deficiency weakens vascular tissue — a condition called ‘scurvy’ — and causes widespread capillary bleeding, bleeding gums, and loosening of the teeth. Lesser deficiencies can be caused by insufficient C intake, physical or psychological stress, smoking, alcohol use, and infections. Symptoms include fatigue, lassitude, loss of appetite, drowsiness, insomnia, irritability, and lowered immunity. According to clinical studies, vitamin C suppresses cancer, heart disease, Parkinson’s, and Alzheimer’s; it speeds wound healing. 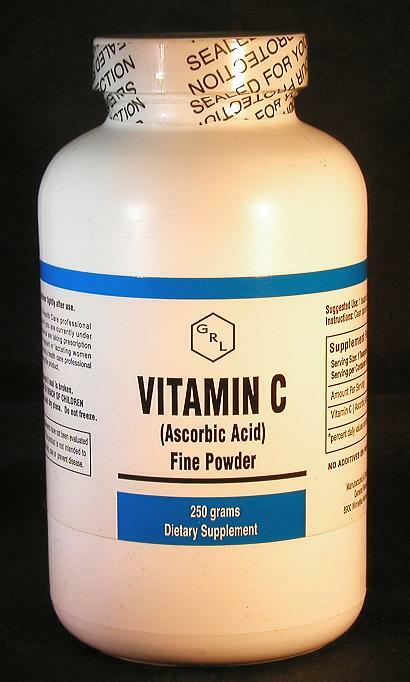 In other studies, vitamin C supplementation (at 1000 mg/day or more) consistently decreased the incidence, symptoms, and duration of colds, and reduced the risk of pneumonia by 80%. In a study of 700 students, Vitamin C (at 1000 mg/hour for the first 6 hours followed by 3000 mg/day) reduced cold and flu symptoms by 85%.